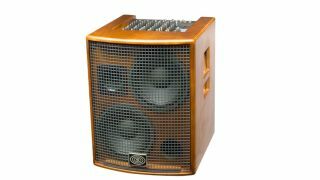 Summer NAMM 2013: Schertler has unveiled the Jam Series, a new line of acoustic amplifiers that will be making their debut at Summer NAMM 2013. The series comprises three models - the Jam 100, Jam 150 and Jam 400 - which are each finished in wooden cabinets. The high-fidelity amplifiers feature onboard mixers with both XLR and 1/4" inputs and dedicated vocal inputs, as well as built in digital effects including reverb. Prices begin at $999 for the Jam 100. For more information, visit the official Schertler website. Schertler has introduced a line of high fidelity acoustic amplifiers to be shown at the Summer NAMM Show in Nashville, Eastman Guitars booth #1512. The Schertler Jam Series features a wide range of high-performance, classic wood cabinet amps, the Jam 100, Jam 150, and Jam 400. With the Schertler Jam Series, we know your musical instrument is a prized possession, and its sound deserves to be authentically reproduced and amplified with the best possible audio quality. Since its foundation in the early 1980s, Schertler has embarked on a passionate endeavor of research aiming to achieve the highest levels of fidelity in the reproduction of acoustic stringed instruments. Today, the Schertler brand is a standard for live performance, broadcast and recording applications and proudly lists some of the world's leading orchestras, ensembles and solo artists as ambassadors.